NASHVILLE, Tenn.— Wearing baby blue scrubs and a wide smile, Dr. Edwina “Eddy” Collins looks like the type of dentist who would put a patient at ease. By day, she works in a second-floor office with wide windows and three dentist chairs at Noesis Dental in nearby Brentwood. Off-hours, she can usually be found at the boxing gym. Being a dentist has prepared Collins for the sport’s mental component. She often has to practice staying calm for her patients when they are in the dentist’s chair. Staying calm is also a vital skill in the ring. The skill will come in handy in February, when Collins will compete in her first masters division boxing tournament, contending for a national title. Collins, 45, began boxing only three years ago but says she feels ready to compete at the national level. Collins, who describes herself as competitive, played several sports in high school and college including volleyball, tennis and basketball. Boxing is her first contact sport. She enjoys it, she says, because it is exciting and allows her to unwind. 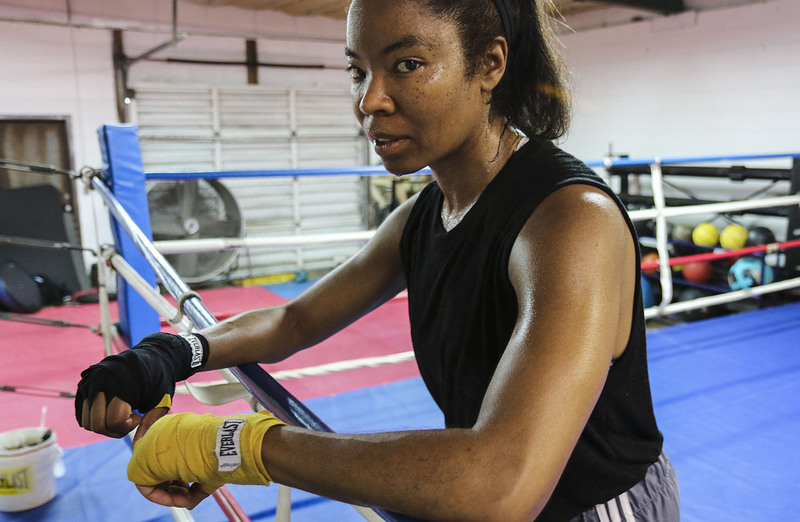 Collins trains three times a week, for a total of 10 hours, at the Boxing Resource Center, a nonprofit facility that teaches Olympic-style boxing to young people and adults. Each session is physically demanding and requires her to jump rope, train with weights, and practice footwork, shadow boxing and drills to build up stamina in her arms. In the weeks leading up to a match, the training intensifies. Typically her coach, Sena Agbeko, will lead a six- or seven-week camp, which means the training increases from three days a week to five. To win the fight in February, Collins will have to demonstrate her skillfulness in the ring. The judges will count the number of punches thrown and observe how aggressive each boxer is. Ultimately, the one who shows the most skill and aggression during the match will prevail. Collins describes how winning a match requires playing a strategic mental game. “You’re trying to figure out your timing. It’s a game,” she says. Rather than simply throwing punches, action “has to be calculated,” she says. Salgu Wissmath, a CQS intern this summer at The Courier-Journal in Louisville, Ky., earned her master’s degree in photography from Ohio University School of Visual Communication in May.